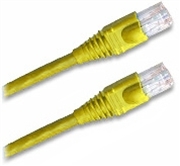 Our Ethernet Cat 5E cable is designed for a number of networking applications. Cat5e patch cables are perfect for use with: Network Adapters, Hubs, Switches, Routers, DSL/Cable Modems, Patch Panels and other Computer Network applications. If you can't find what you need, or would like a quote on a custom patch cable that meets your exact specs, call us at 800-296-4411 or click here to request a quote.